Angkor Guide Sopanha, Siem Reap Guide, Angkor Guide, Angkor Wat Guide. We are now in Peak Season (October-March) of tourists, if you want to have your experienced guide, please Try your Best to make Tour Reservation in advance. We offer the best price (See in TOURS & PRICES). WE ARE A TEAM OF EXPERIENCED GUIDES IN CAMBODIA, IF YOU NEED YOUR EXCELLENT, PROFESSIONAL TOUR-GUIDES, PLEASE TRY TO BOOK YOUR GUIDE IN ADVANCE, OTHERWISE, YOU WILL BE LATE. RATES QUOTED ARE PER TOUR, NOT PER PERSON MAKING YOUR TOURS EXTREMELY AFFORDABLE. For myself, I am a Tour-Guide, Tour Manager and also a Film Fixer for making DOCUMENTARY, especially for Channel News Asia, Singapore. Please watch my interview with Dr. Farish about Preah Vihear temple, Click here to see the Interview. *** Trip Included: tour-guide, Fee Admissions, Transportation, Cold drinking water. My name is Yous Sopanha, I have been working as a tour guide for many years in Angkor Archaeological site as well as other tourism sites around Cambodia. 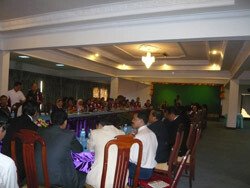 I hold 2 Bachelor Degrees from Phnom Penh University in Social Science (history, philosophy…). Born in 1965 is old enough to graduate and recognize the history of Cambodia, so I have many experiences in Social Science. 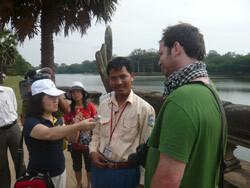 I am an operator of Angkor Guide Sopanha in Angkor archaeological Site, Siem Reap as well as other sites of Cambodia. From 1994 -1998, I was a high school teacher, I taught Khmer History, Culture and Civilization. From 1998-2003: Program Manager at CWF (Cambodia World Family), Integrated Rural Development Projects. We had main projects in Literacy and Violence, we focused on illiterate people and domestic violence because of almost 2 decades of civil war, many people became illiterate...and it caused domestic violence in families. Angkor Guide Sopanha is not a Travel Agency. It has been prepared with the needs of all Travelers in mind. I am not only a tour guide, I am also an interpreter in a formal meeting or in workshop and a fixer for journalist, photographer, writer and researcher, who need to make a story…like; I help writers to search about Local Khmer healer, street children..
Hong Kong, France, Germany, especially the whole European countries. I have provided innovative services, and breakthrough pricing to hundreds of satisfied visitors throughout the world. Our business has always been conducted by Phone- WhatsAPP and e-mail. We understand the intricacies of the expensive travel and we can provide the entire experience, including travel arrangements and special services. We can help you with your concerns. Our goal is to make sure that the travel aspects are handled properly and effectively. Hundreds of satisfied visitors bear witness to our success in meeting their expectations. Our business is based on a long term relationship with our visitors. We focus explicitly on delivering the total experience to our visitors. I try my best to provide you with real exciting, marvelous and amazing tour, which is unforgettable. Our promise to you is EXCELLENCE in service, EXPERTISE in planning every detail of your journey and EXPERIENCE that you can trust. Contact us today and tell us help you with your plans.